Thanks to The Hashtag Show, we have some new rumored details regarding Captain Marvel. Specifically with who the main villain in the movie could be. There's not a lot known about the film other than the fact it's set in the 90s and Captain Marvel and Nick Fury will somehow find themselves in the middle of a war involving the Skrull and Kree alien races. Brie Larson is set to play Captain Marvel, Jude Law will be playing Mar-vell, Samuel L. Jackson is expected to reprise his role as Nick Fury, and Ben Mendelsohn could end up playing the main villain of the film. The jealous rival of Kree hero Mar-Vell, Colonel Yon-Rogg first appeared in Marvel SuperHeroes #12 where it was revealed that he had been charged by the Supreme Intelligence, along with Mar-Vell, with observing and reporting on Earth to determine if the evolving species had become a threat to the Kree Empire. Yon-Rogg used his authority to sabotage Mar-Vell in hopes of stealing the heart of Una, a Kree medic assigned to the mission and the love of Mar-Vell. Mar-Vell escapes Yon-Rogg’s treachery and goes undercover on Earth, adopting the persona of Walter Lawson, a dead scientist who was working on a base that contained Kree Sentry #459 which had been defeated by the Fantastic Four. Yon-Rogg’s repeated attempts to destroy Mar-Vell ultimately lead him to attempt to kill Carol Danvers, the head of security at the base where Mar-Vell worked as Lawson. It was during this attempt that Danvers underwent the accident that caused her to gain the powers she possessed as Captain Marvel. There have been previous reports that the original script for the film contained a version of Carol Danvers' origin story that was in line with the details provided above. But, obviously, the story could be changed up as Marvel and the creative team working on the film continue to develop it. With Mar-vell being involved with the story, it would make sense to take the film in this direction. 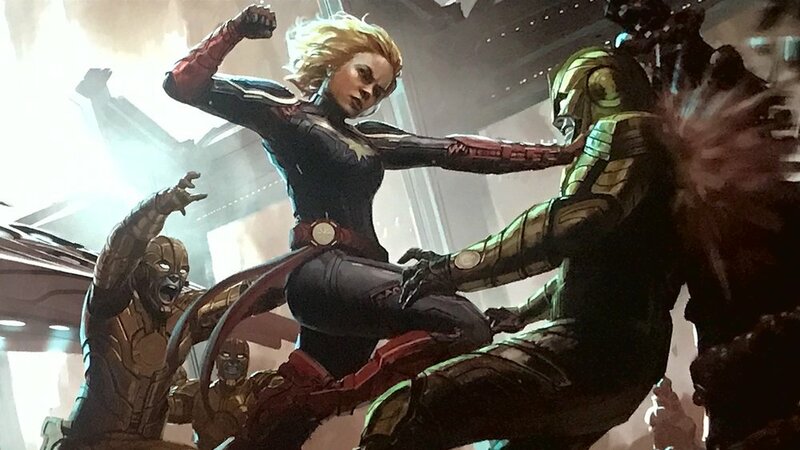 It makes me wonder if that is who Captain Marvel is attacking above in the previously released concept art for the film. What do you think about the possibility of Yon-Rogg being the main villain in Captain Marvel? Half Nelson directors Anna Boden and Ryan Fleck are helming the film from a script written by Geneva Robertson-Dworet (Tomb Raider), Meg LeFauve(Inside Out) and Nicole Perlman (Guardians of the Galaxy). The movie is set to be released on March 8, 2019.